Owner Jeff Renbarger, left, and team member Josh Vetor at the newly-opened Menchie’s self-serve frozen yogurt store at 13170 Harrell Pkwy., Noblesville. 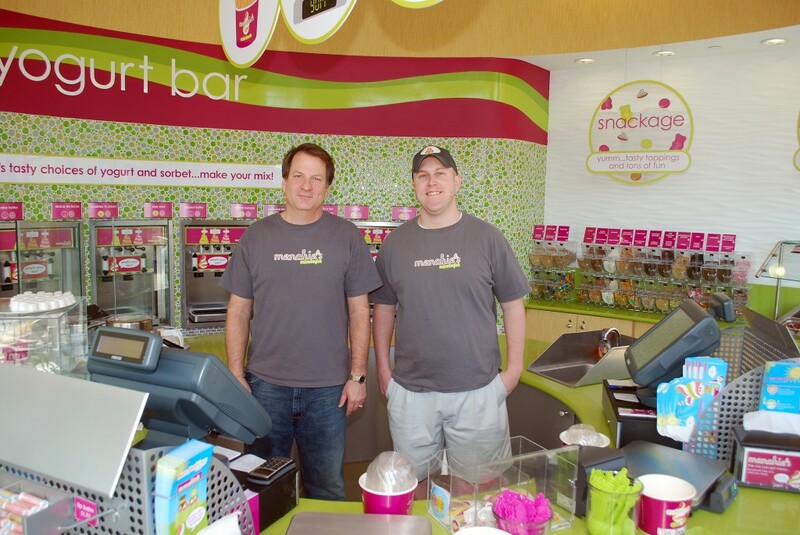 Local entrepreneur Jeff Renbarger recently opened the newest and tastiest businesses to open in Noblesville – Menchie’s, the leading chain of self-serve frozen yogurt stores, at 13170 Harrell Pkwy. The Hamilton Town Center location is also the first Menchie’s to open in Indiana. “It’s pretty exciting to be the first one in Indiana, and Noblesville is the perfect area for it,” Renbarger said. Menchie’s is a unique frozen yogurt brand that places a strong emphasis on the experience its guests live every time they visit a store. Offering a vibrant atmosphere complete with party rooms, chalkboards and bright colors, Menchie’s encourages families to come in and spend a memorable, fun-filled day together. “It’s a fun escape. Every guest gets a gift besides the yogurt before they leave,” Renbarger said. Menchie’s guests help themselves to an unlimited mix of yogurt and toppings at a unique self-serve station with more than 100 rotating yogurt flavors from cake batter and pomegranate tart to chocolate silk and vanilla snow, and more than 70 rotating toppings including fresh fruits, granolas, nuts, an assortment of candies and hot fudges. Renbarger said the Noblesville store has 21 choices available each day. “Some flavors – like vanilla, chocolate and original tart – we don’t rotate,” he said. Instead of using mixes, Renbarger said an executive chef oversees the Menchie’s unique product line of private branded yogurt. The store also provides healthier alternatives by offering nonfat, low-fat, no-sugar added and low-carb options. “We really have about everyone covered,” said Renbarger, adding Menchie’s uses the highest-quality frozen yogurt and contains live and active cultures, and is endorsed by the National Yogurt Association. Instead of having set sizes and prices, the weight of frozen yogurt and toppings determines the cost. Renbarger said each ounce is 45 cents and waffle cones are an additional $1. Menchie’s is also actively involved in the communities it serves by partnering in fundraising activities and education incentive programs. Each Menchie’s store donates thousands of dollars in cash and products annually to local schools to support student programs. Menchie’s Hamilton Town Center, 13170 Harrell Pkwy., Noblesville, is open 11 a.m. to 10 p.m. Sunday through Thursday and 11 a.m. to 11 p.m. Friday and Saturday. For more information, call 773-6628 or visit www.menchies.com.